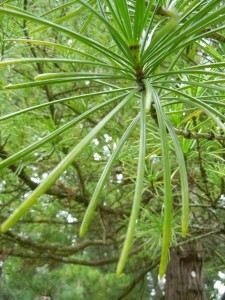 Sciadopitys verticullata, commonly known as the Japanese Umbrella Pine, is unique in that it is the only member of its genus. It is from the family of evergreens called Sciadopityaceae. As the name suggests, it is native to Japan in mixed middle altitudes at about five hundred meters to a thousand meters tall, in clouded forests with high rainfall and humidity. It grows well in most lights, full or partial sunlight or shaded areas, but does not tolerate very high temperatures well; in such climates, it would prefer small amounts of shade. Its ideal soil is slightly acidic. Its name is indicative of both the region where it grows and its leaf taxonomy. 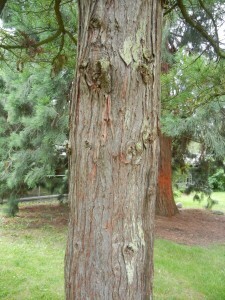 The tree has two different kinds of leaves; mature leaves are dimorphic. There are scale leaves, which are the true leaves; and the leaves that occur at the ends of the shoots in whorls, which conduct photosynthesis. Its true leaves appear interspersed on the branches in a random pattern, and are small and scaly. Its photosynthetic leaves, which are thin slightly flattered needles, are arranged in whorls that grow at the ends of branches. Each whorl contains about twenty to thirty soft, flattened, pliable, dark green needles that average to be about six to thirteen centimeters long, two to three millimeters wide and one millimeter thick. They also have a prominent mid-line groove on both sides. The whorls of the needles are arranged at the end of the branches so that they resemble the ribs on an umbrella. The leaf whorls are alive for approximately three to four years before they regenerate. 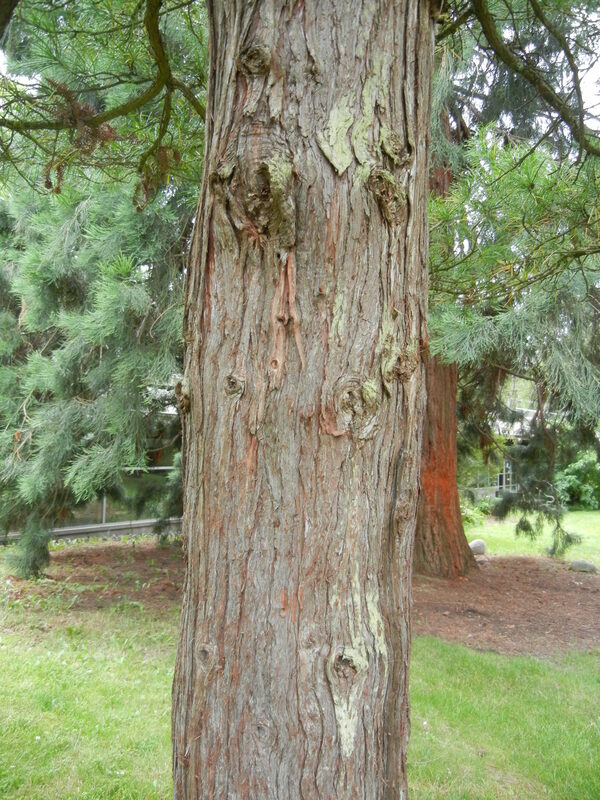 Its bark is a thick, soft red-brown colour with a stringy texture. Its wood presents distinct growth rings, and its heartwood is distinctively coloured. The wood has a distinct “spicy” smell and taste. It has tracheids with without alternate nor opposite bordered pits; without pit-border thickenings. Axial parenchyma is absent in the wood, as well as ray tracheids (occur very rarely). Normal vertical resin ducts are also absent. 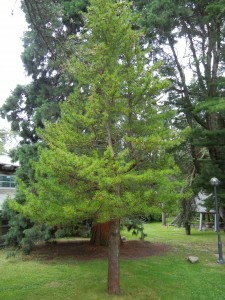 S. verticullata often grows to be about twenty to thirty feet tall with a spread of about fifteen to twenty feet, but there have been documented cases of trees growing to ninety feet tall in Japan. It is a slow growing tree, often only growing four to five feet in its first ten years of growth. Also, it tends to be more dense and narrow when it is young with an overall pyramidal shape, and then open up with age, with a moderate density of the branching. The canopy is overall symmetric in its pyramidal shape with a regular or relatively smooth outline. It is a cone-bearing tree, with ovulate cones approximately four inches in length. The cones have scales that appear thick and chunky. The cones do not often grow on young plants; they initially emerge green and remain so for a year, then in the second year they mature and darken to a brown colour. The cones are fragile and disintegrate soon after the cones release their seeds. 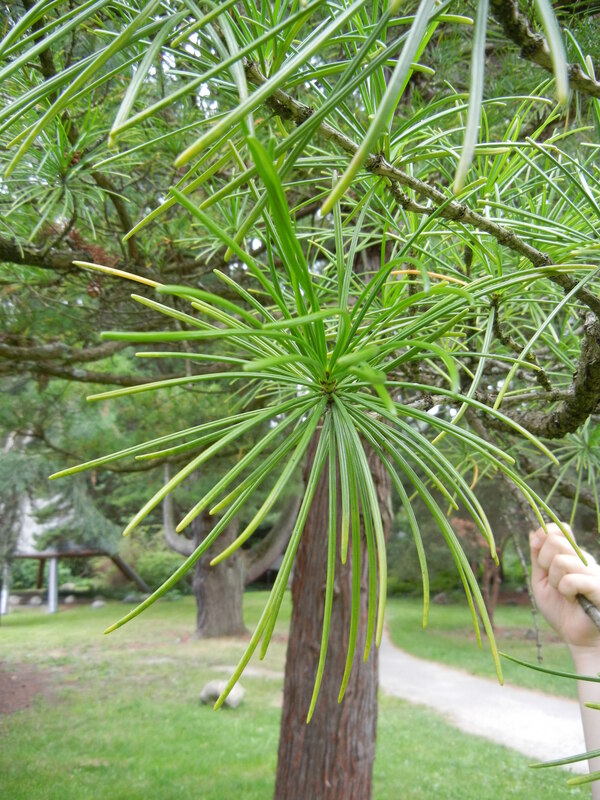 Ovules for the tree occur in female cones and they each produce about five to nine ovules. Pollen is produced in male cones, in terminal, compact clusters. There are approximately five to nine pollen sacs per microsporophyll. Its seeds prefer to settle in small gaps of the forest floor rich in minerals. It is also possible for the tree to grow from cuttings. 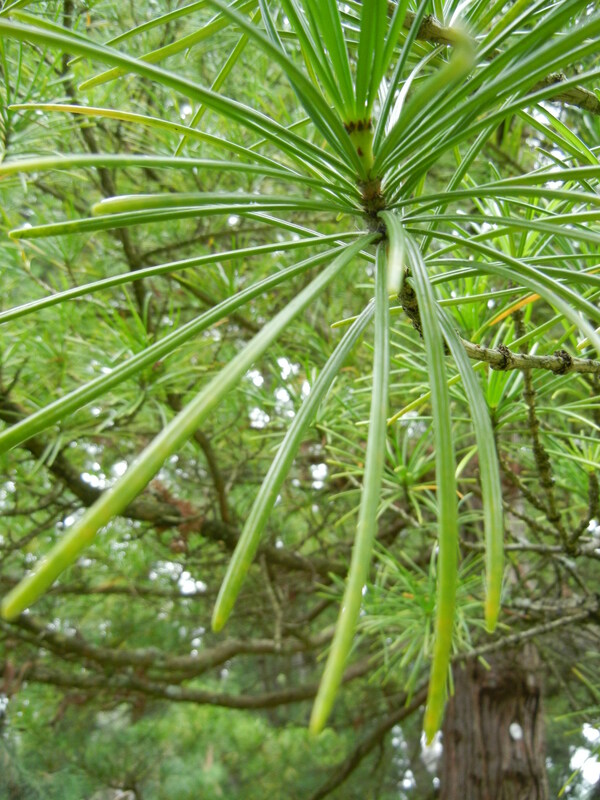 Multiple varieties of the Japanese Umbrella Pine exist. There is the “Aurea”, the “Ossorio Gold” and “Ann Haddow” which can be distinguished by their more golden needles. 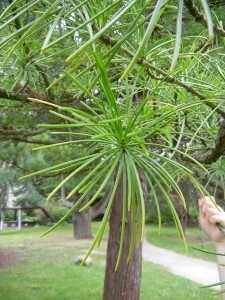 The “Variegata” is unique in that it has green and yellow needles. The “Jim Cross” is a version that only grows to be about 10 feet tall and the “Pendula” is distinguishable by its unusual weeping branches. Finally, the “Windergree” has bright green foliage and plastic-looking. Due to the slow growth rate of the tree, populations are declining in their natural habitat due to human uses. However, due to their natural beauty, many people enjoy putting them in their gardens. They are mostly enjoyed for their ornamental purposes, as specimen plants. In Japan, the wood is used for making boats, and the bark for caulking (process of sealing joints or seams in structures and some types of piping, for example, in wooden boats). 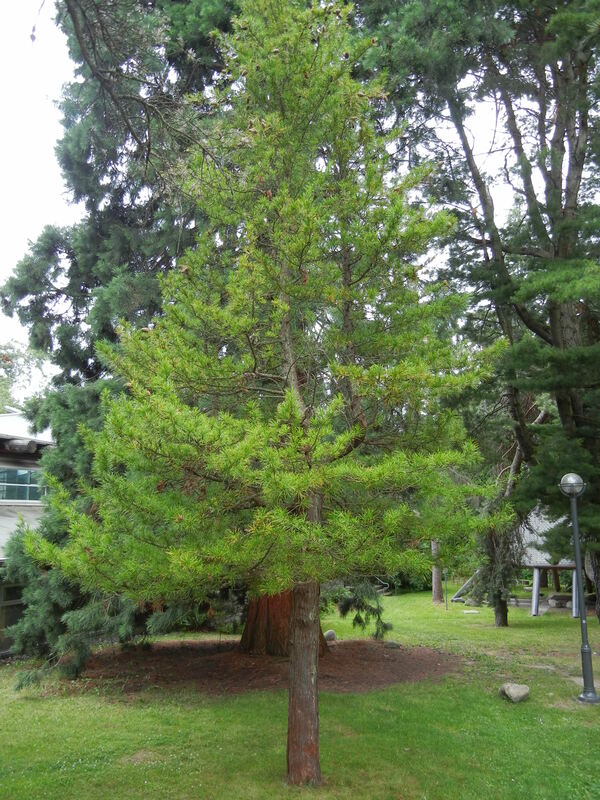 It is also one of the “Five trees of Kiso” treated as sacred in Japan. Due to the fact that they can be grown from cuttings, they can also be used to create bonsais.